Lokayukta and Lokpal have been passed in the parliament but till today it has not been implemented in any state of the country. My fight is to let the government to implement it at every state so people can fight for their rights. I know the government will not easily do the work because it will stop the illegal earning. The fight is difficult but people’s participation will one day let this happen and requested the youths of state to fight for it. I will fight till the death for the development of country and society. To the change the present system of governance where there is corruption in every government sector. I am 80 years of age today but my concept is clear to make a change in the law of country. Meanwhile he asked the people to question the government where you find there is corruption or any kind of irregularities in the system of working and development of any district, state and country. 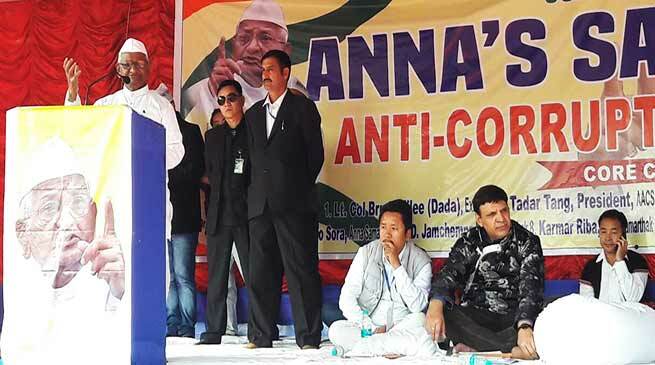 Payi Gyadi the renowned social activist and a member of Annas Anti-Corruption satyagraha in his speech asked the BJP led Pema Khandu government to immediately implement lokayukta and Lokpal in the state. Corruption in state is growing day by day and until and unless we start questioning, we can’t derive anything out of it, he said.